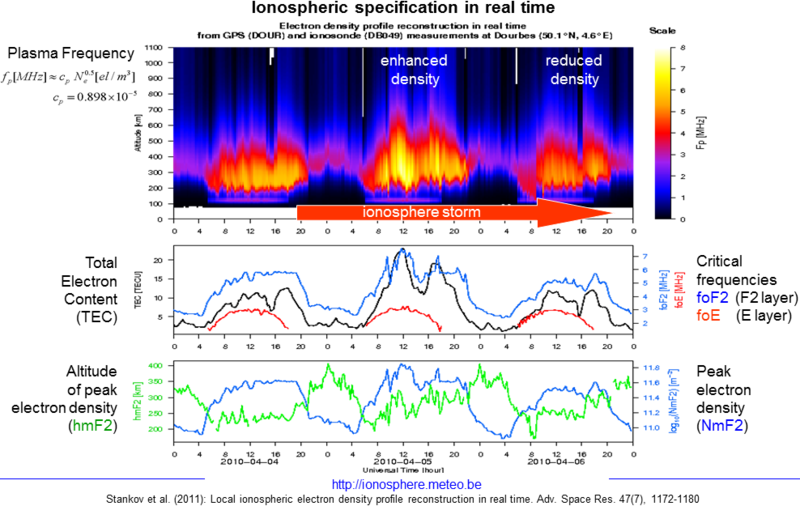 Permanent monitoring of the ionospheric condition/activity is crucial for understanding the complex nature of the ionosphere and for mitigating the ionospheric effects. The primary focus here is on monitoring and investigating the ionospheric phenomenae/effects plus developing (local) operational services that can help the users in their efforts to mitigate eventual ionosphere/space weather effects. The Total Electron Content (TEC) is the integral of the electron concentration on the GNSS receiver-to-satellite path, results usually presented in TEC Units (TECU): 1 TECU=1016 electrons/m2. The GNSS-derived TEC has proved to be a robust characteristic representing well the state of the Earth’s ionosphere-plasmasphere system during both quiet and disturbed geomagnetic conditions (Jodogne and Stankov, 2002). In fact, the very existence and dynamics of the Earth's thermosphere-ionosphere-plasmasphere system are determined by the solar and geomagnetic processes which are able to inflict strong and multi-faceted response from the system and one of its main characteristic—TEC (Jodogne and Stankov, 2002). While the long-term (average) behaviour at a given location is primarily determined by the level of solar activity, the short-term behaviour is additionally influenced by atmospheric and solar-terrestrial conditions, most important being the geomagnetic activity (Stankov et al., 2010). Thus, monitoring the GNSS TEC is very important; not only in a stand-alone service but also as part of other relevant services, e.g. in the LIEDR system (Stankov et al., 2011). Here is a link to the TEC operational service. Vertical Incidence Sounding (VIS) remains one of the most accurate and important ionosphere-monitoring techniques (Jodogne and Stankov, 2002; Stankov et al., 2012; Sapundjiev and Stankov, 2016). In this technique, low- and high-frequency radio waves are transmitted upward and reflected in the ionosphere at the height where the refractive index becomes zero for vertical incidence. In the ionosonde, a transmitter and a receiver are swept synchronously in frequency, and the propagation time of the reflected signal is recorded for each of the transmitted frequencies. Thus, the resulting ionogram is an instantaneous record of the ionospheric conditions (above the sounder) indicated by the relationship between the frequency of the radio pulse emitted upwards and the virtual heights of echoes reflected from the ionosphere. In a typical ionogram, the frequency range covers the interval 1–20 MHz and the height range covers 0–1000 km. Many present-day applications rely on operational automatic scaling by digital ionosondes for regularly obtaining the most important ionospheric characteristics. In April 2011, a new digital ionosonde, Lowell Digisonde-4D (DPS-4D), was installed at the RMI Geophysical Centre in Dourbes (http://digisonde.oma.be/) together with the latest version of the computer software for automatic ionogram interpretation, ARTIST-5. The digisonde was also equipped with new transmit and receive antennas which substantially improved the quality of measurements. The installation and the initial calibration went smoothly and since then the digisonde is being operated in a high time resolution mode, one sounding per 5 minutes. 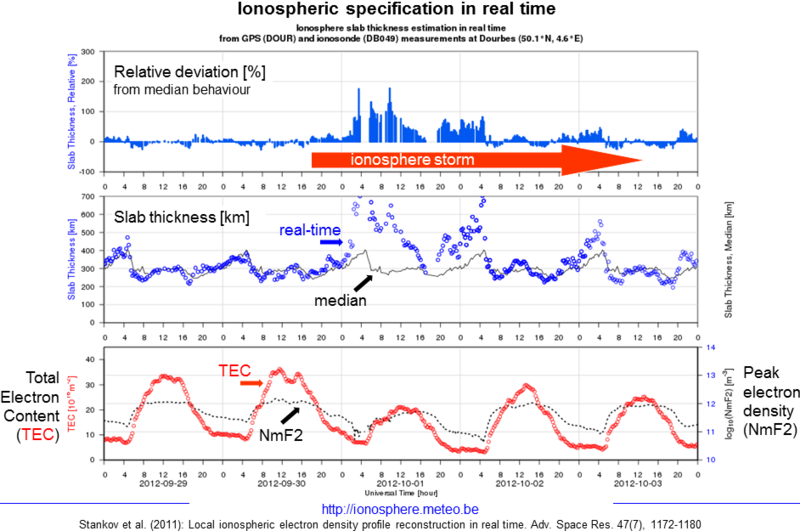 Here is a link to the operational service displaying the most recent and current autoscaled values of key ionospheric characteristics measured by the ionosonde in Dourbes. 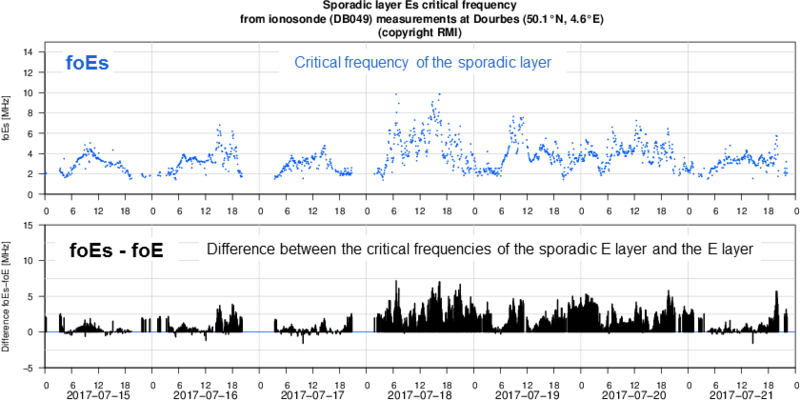 The ionospheric sporadic E-layer (Es) is an irregular layer of ionisation occuring within the ionospheric E-layer and characterised by small thin “clouds” of intense ionisation, an altitude-thin layer at an unpredictable altitude and/or an unexpected intensity. Sporadic-E events may last from just a few minutes up to several hours. The sporadic E layer is an important phenomenon in radio communication due to its ability to reflect higher frequencies than those typical for the ionospheric E layer and even the F layer—it can support reflection of radio waves at frequencies of up to 200 MHz. Es propagation skip distances are generally around 1600 km, distances for one hop propagation can be as close as 900 km and up to 2500 km. Thus, when present, Es can open up radio wave propagation paths that are generally unreachable. The Es layer behaviour is elusive and not yet fully understood, and as a consequence, it is difficult to forecast. Here is a link to the Es-layer monitoring service. The ionospheric slab thickness, the ratio of the Total Electron Content (TEC) to the maximum ionospheric F2-layer electron density (NmF2), offers substantial information on the shape of the electron density profile, the neutral and ionospheric temperatures/gradients, on the ionospheric composition and dynamics, etc. For example, sharp changes in slab thickness can be attributed to physical processes occurring during geomagnetic storms, such as plasma uplifting, enhanced plasma fluxes from/to the plasmasphere, etc. 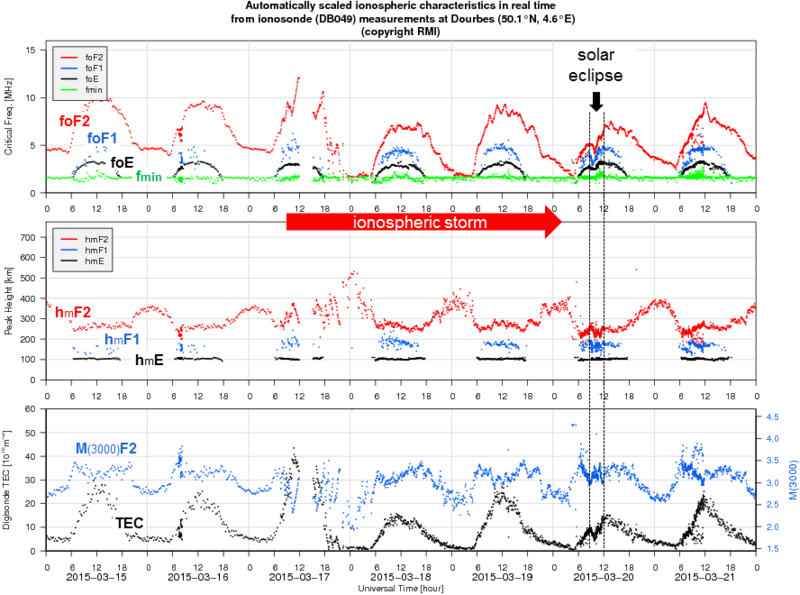 The ionospheric monitoring capabilities of the slab thickness remain largely unexplored, despite the fact that, operationally, it is a very useful parameter because it allows a simple conversion between the critical frequency (foF2) and TEC and additionally, it closely relates to other important ionospheric characteristics. From this aspect, various possibilities exist for utilising the ionospheric slab thickness modelling/monitoring efforts (Stankov and Warnant, 2009). For example, if having instantaneous access to data from regional/global digital ionosonde and GNSS reference networks, it would be possible to provide regional/global monitoring of the slab thickness in real time. If available in real time, over a location/region of interest, the operational slab thickness monitoring can be used for characterizing and eventually predicting the ionospheric density distribution/gradients, the extent of ionospheric density anomalies and their propagation characteristics, etc. Thanks to the regular digital ionosonde and GNSS TEC measurements carried out at Dourbes, a monitoring system has been developed to provide better real-time ionospheric characterization and understanding of the local ionospheric dynamics. Here is a link to the local ionospheric slab thickness operational service. The purpose of the LIEDR (Local Ionospheric Electron Density profile Reconstruction) system is to acquire and process data from simultaneous ground-based GNSS TEC and digital ionosonde measurements, and subsequently to deduce the vertical electron density distribution in the local ionosphere (Stankov et al., 2011). LIEDR is primarily designed to operate in real time for service applications, and, if sufficient data from solar and geomagnetic observations are available, to provide short-term forecast as well. For research applications and further development of the system, a post-processing mode of operation is also envisaged. In essence, the reconstruction procedure consists in the following. The high-precision ionosonde measurements are used for directly obtaining the bottom part of the electron density profile. The ionospheric profiler for the lower side (i.e. below the density peak height, hmF2) is based on the Epstein layer functions using the known values of the critical frequencies, foF2 and foF, and the propagation factor, M3000F2. The corresponding bottom-side part of the total electron content is calculated from this profile and is then subtracted from the GPS TEC value in order to obtain the unknown portion of the TEC in the upper side (i.e. above the hmF2). Ionosonde data, together with the simultaneously-measured TEC and empirically obtained O+/H+ ion transition level values, are all required for the determination of the topside electron density scale height. The topside electron density is considered as a sum of the constituent oxygen and hydrogen ion densities with unknown vertical scale heights. The latter are calculated by solving a system of transcendental equations that arise from the incorporation of a suitable ionospheric profiler (Chapman, Epstein, or Exponential) into formulae describing ionospheric conditions (plasma quasi-neutrality, ion transition level). Once the topside scale heights are determined, the construction of the vertical electron density distribution in the entire altitude range is a straightforward process. As a by-product of the described procedure, the value of the ionospheric slab thickness can be computed instantaneously. The LIEDR procedure has been implemented at the RMI Geophysics Centre in Dourbes (50.1°N, 4.6°E) where a GPS receiver is collocated with a digital ionosonde (URSI code: DB049, type: Lowell Digisonde 4D). Currently, the nominal time resolution between two consecutive reconstructions is set to 5 minutes. Several applications are envisaged. For example, the ionospheric propagation delays can be estimated and corrected much easier if the electron density profile is available at a nearby location on a real-time basis. Also, both the input data and the reconstruction results can be used for validation purposes in ionospheric models, maps, and other monitoring services. Here is a link to the LIEDR operational service. LIEDR is being constantly upgraded. For example, based on the detailed analyses of topside sounder data (Verhulst and Stankov, 2013; 2014; 2015), we are now able to more adequately model the topside ionospheric plasma distribution. Also, the behaviour of the altitudinal solar terminator for a given location has been thoroughly investigated together with the influence of the height-dependent sunrise and sunset on the ionospheric E and F layers (Verhulst and Stankov, 2017). As a result, mathematical formulae have been deduced, and an algorithm developed, for calculating the height of the terminator as a function of the geographic latitude and the day of year. The algorithm has been successfully implemented and proved to be efficient in substantially improving the reconstruction of the vertical electron density profile by minimizing, and in many cases even eliminating, the discrepancies between consecutive profiles that used to occur during sunset when switching from day-time to night-time profilers.